French publisher IELLO has never been shy about cultivating and driving innovation in board games. With titles like King of Tokyo and Bunny Kingdom, they have repeatedly set the pace for other design houses to follow, but in my opinion, 8Bit Box might be one of their most unique propositions to date. 8Bit claims to be the world’s first board gaming console and the branding (including six bundled control pads) matches that claim to a tee. Considering its ambitious scope, I’ve been keen to check out 8Bit since it launched earlier this year — has IELLO hit the mark? Or is 8Bit Box just another gimmick in a rapidly saturating market? 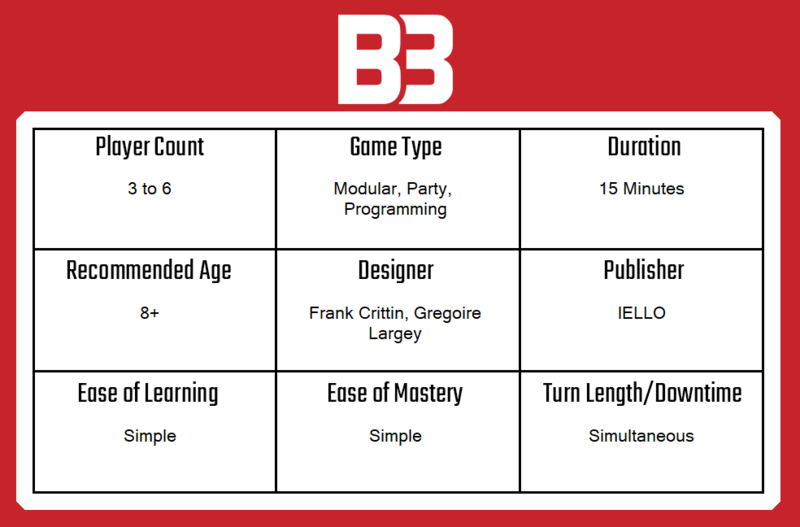 8Bit Box could be compared to something like a classic games compendium in a sense, but rather than simply placing a number of individual games in one box and calling it a “three in one”, 8Bit Box uses common components to link each of the individual “game packs” that it contains. Each game pack then contains its own instruction manual, components and theme and there are three packs included in the core box. There’s also room for at least one more game, which I expect will be released as a kind of expansion in the future. The core box is incredibly generous, considering what comes included in the box of most video game consoles these days. Where an Xbox or a PS4 will typically be bundled with just the basic cables and a control pad, 8Bit Box impressed me by having six controllers and three extremely varied games included in the box. Each of the games (Pixoid, Stadium and Outspeed) is styled on a classic retro video game and considering that a fair number of the components are shared across all of them, I was surprised by their individual play styles. Pixoid is a relatively obvious Pac-Man clone that has two or three (of four) players acting as baddies whilst the other, remaining player must evade capture for as long as possible whilst moving around a grid. Stadium is a fair approximation of any classic Track and Field game that manifests as a series of linked mini games for two teams of up to six players. Finally, there’s Outspeed (which I admit to being my least favourite of the set) that appears to be based on F-Zero and delivers a tough, occasionally cutthroat racing experience. Aside from the components, there’s no link between the games (so it’s not like there’s a campaign mode) and overall, the weight of 8Bit Box is on the light side. Although I wouldn’t say that it’s a party game, the fact that it has six controllers (and the lowest player count in any game is four) means that 8Bit Box makes a good party game, or alternatively it’s a nice way to kick off a gaming night whilst you’re waiting for perhaps the last few people to arrive. I can only speculate on what’s to come, but the components in the box would certainly support slightly heavier games – perhaps in the style of Tiny Epic Quest, for example. Simply put, 8Bit Box is one of the most attractive and generous games that I’ve played this year. The box itself is large and attractive, with a sleeve that slides away to reveal a NES inspired inner shell. Upon opening that shell, the player will be delighted to find three individual game packs, each with its own distinct artwork and style. There’s also a tray that holds the six controllers, each of which comes pre-assembled with three rotating dials. The controllers are thick, heavy and superbly built, with unique colours and in some cases artwork that make them stand apart from one another. Finally, beneath the controllers, there’s a second tray that contains a number of cubes and dice of various colours. Inside each of the game packs are the components that are unique or essential to that game specifically. In the three games that come bundled, each contains a brief and relatively clear manual that had me able to play each of the games within five minutes at the very most. The card stock in some cases is a bit thinner than I would have liked, but it’s not a major problem. Tokens, for example, are thinner than most, even though pieces that constitute elements of the board are more like regulation thickness. The plastic elements in 8Bit Box are well made and plentiful, with the inclusion of a spare cube for each of the six colours (to match the controllers) being a particularly nice touch, especially considering that I think a lot of youngsters are likely to be getting their hands on the contents of 8Bit Box at some point The dice, also, feel well made and of a nice weight, so rolling them is always a pleasure. Overall, I think 8Bit Box feels like a real treat to open and show to friends and the experience never feels less exciting no matter how often you do it. If it wasn’t for the fact that 8bit Box features relatively simple games, this section of the review might take an absolute age. As it stands, i’ll give a relatively brief overview of each individual game, but I should also mention that it’s the controllers themselves that create a common link between them. Each of the three dials will be used for different things in different games, but on the majority of occasions in 8Bit Box, the common link is programming moves simultaneously, then executing them. In Pixoid, for example, the players will use the directional pad on the left of the controller to move their character as well as the central wheel to confirm how far. The players acting as baddies (I’m loathe to say ghosts, but that’s how I see them when I play the game) chase Pixoid around the map whilst he or she collects up to twelve cubes, one per turn that they are not caught. There are four bonus cubes for Pixoid to collect on the board (for a maximum of sixteen in total) and conversely, if the baddies catch Pixoid, then they will each receive points equal to the number of cubes that remain in the reserve. After each player has done one round as Pixoid, the game ends and the highest score overall wins. Stadium, on the other hand, features ten track and field style events that are randomised and placed face down on the table in a really cute, oval track style presentation. Each round, the next event is flipped up and the two teams of players will participate in a mini game. This might be as simple as bidding energy (which is limited) or it could involve dice rolling or some other luck mechanism. There are more events than each game will accomodate, including rest events that allow energy to be regained. At the end of the game, the team with most medals will win, with medals of different value being handed out in the different events. The last game, Outspeed, is the most complex, although it is still relatively simple by comparison to most games. In this futuristic racing game, the players will spend fuel tokens to make progress along a track that is represented by an abstracted set of board tiles. A deck of cards stacked randomly and dished out one at a time sets the challenge for making progress – including avoiding obstacles, turns and bumps and featuring power ups and more. The players simply choose which path they wish to take on each card, then they pay the fuel required to take the path chosen. If a player runs out of fuel, then he or she is out of the game. Again, whilst each of the games in 8Bit Box is linked by the programmatic nature of the controllers around which they centre, there is a different feel from one game to the next. Pixoid, for example, is the most classically simple game in the set and it is probably the fastest game to pick up and have fun with, but Stadium introduces a lot of variety across the games within it – some of which last literally a minute or two including teaching. Outspeed is slightly heavier than the other games and uses a mechanism that is similar to Pixoid to program movement, whilst also sharing the energy (or in this case fuel) management of Stadium. Where it brings its own ideas and additional complexity are really seen in how the track builds out randomly and because it’s the only game to feature off-board elements in the form of power up tokens. Whilst I’ve already said that I liked Outspeed least of all the games in 8Bit Box (and it might be obvious that I liked Pixoid the most) there’s no bad apple in the bunch, which meant that I was always able to convince someone to play with me at games night. Because all of the games are inherently fairly quick and light weight and especially because it supports up to six players, 8Bit Box has become very popular for my group of friends when played either before or after a bigger game and sometimes whilst we’re setting up and waiting for people to arrive. If you’re a household new to board gaming and have players of all ages and abilities, then the variety in 8Bix Box might turn out to be quite appealing, I would think. To summarise, I think 8Bit Box is a beautiful looking product that deserves to take pride of place on any shelf. It’s attractiveness is matched by how innovative and exciting it is to open and setup, which as I said earlier remains a major highlight for impressing friends. The games that come in it are very, very generous from the outset and the variety and fun level is high, with three very different themes that do share some components and concepts, but which are overall unique enough in their own right to be called different. Each game is a lot of fun as well, with a very fast learning time, little downtime and perhaps no more than twenty minutes per game play time, on average. Despite the speed and ease of play, each game also comes with sufficient depth to entertain most gamers, except perhaps those who staunchly refuse to engage the younger side of their brain. All said, 8Bit Box is a very cool idea that is executed well and could make a really nice addition to any collection. A copy of 8Bit Box was provided for review purposes. You can find out more about it on the website of publisher IELLO. A copy can be purchased from 365 Games, or via Amazon.